The River Protection Project Waste Treatment Plant. -- I worked here 2001-2005. Geodashing Golf - I get a lot of exercise playing this game. each of the latitude and longitude integer degree intersections in the world. -- I use ExpertGPS software from this vendor. 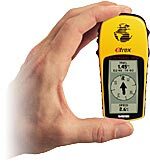 -- I use OziExplorerCE on my PocketPC and OziExplorer on my PC. A great site for information!